Watch out! Any accident on the road can be a severe one. Ones that involve the large vehicles discussed here can become deadly quickly. With thousands of semis traveling across California daily, accidents are inevitable. Often, truck drivers are well trained but demanded upon. They get asked to make impossible deadlines, often while tired. And sometimes that leads to severe accidents. But there are other cases where the truck mechanics do a bad job. Also, sometimes the trucks are not well maintained or manufactured. In other words, trucks can be a catastrophic accident waiting to happen. What are the Immediate Effects of a Tractor-Trailer Truck Accident with a Smaller Car? Regardless of the type of accident the tractor-trailer has caused, there are many immediate effects. Severe injury or death is a likely result for anyone unfortunate enough to be in a struck car. Victims often suffer permanent injuries, including paralysis, brain damage, and amputations. The death of a loved one could cause severe stress for family members that shatters a lifestyle. It’s important to remember that you are not alone. When facing the aftermath of such a horrible accident, there are many factors to consider. These include actions taken by the other driver and the truck company in keeping the roadways safe. Similarly, did the state or local agency not correctly maintain the roads or streets, allowing for such an accident to occur in the first place. Do 18 Wheelers Take Longer to Stop? Yes, they take longer to stop than passenger cars. Eighteen wheeler accidents also include factors not typically seen in smaller vehicle accidents. For example, this consists of the freighted material, much longer stopping distance, and sheer weight and size of the vehicle and trailer. But all of these factors can make a scary combination. 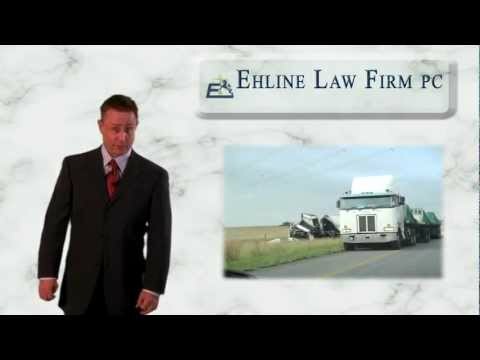 Why Is It So Important to Have the Help of a Lawyer for a Tractor Trailer Crash? When faced with the medical or funeral expenses after such an accident, it is vital to have a specially trained attorney could assist in rebuilding your life. The medical bills and the need for treatment may grow. And the insurance companies may try to get out of paying for your needs. But you might need to negotiate with worker’s comp or get onto disability. You may need to recover back pay, and a means to sustain your family. You may have gruesome scarring that makes it difficult to travel outside and the effects of long-term pain. The attorneys can solve any of these and more at Ehline Law. They’ll travel anywhere in Southern California, 24 hours a day, seven days a week. And they do so to take care of accident victims. In addition, they will make sure that clients can land on their feet. So call one of our expert lawyers today. After that, get more information or to sit down for a free consultation.